A bronze horizontal dial about 18 inches diameter on a cast concrete pedestal. Perimeter of dial includes three-dimensional cast replicas of roses and butterflies. Bronze gnomon includes replicas of butterfly, tightly-furled rose and leaf. Dial face has hour lines with Roman numerals and 15-minute marks and a sunburst at dial center. The dial rests on a cast concrete pedestal. An armillary steel ring equatorial dial approximately 4 feet diameter. Hour ring has Roman numerals cut through the ring to show EST. Mounted on a concrete pedestal marked with city name and builder's mark. The pedestal is also marked with Marshall town map coordinates 35.79° N, 82.68° W, which are not the precise coordinates of the dial. Weathered finish is green enamel paint on steel. The concrete pedestal is marked with Marshall city name, builder's mark and approximate coordinates. 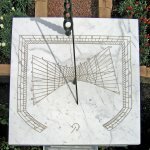 A 12 inch octagonal carved sandstone horizontal dial with Roman hour numerals from 4 AM to 8 PM. The gnomon is missing. Dial face includes carved figures of a snake and a thistle and is marked latitude 40° 35'. The 1763 date ascribed to the dial's origin is coincident with the relief of the siege of Fort Pitt during Pontiac's Rebellion in that year. The 42nd and 77th Regiments of the Highland Guard and the 60th Regiment of the Royal Americans defeated the Native forces (Delaware, Shawnee, Mingo and Huron Tribes) at the Battle of Bushy Run in August, 1763, successfully quelling the Indian uprising in Southwestern Pennsylvania. The Highland Guard is artistically represented on the sundial by the thistle and the Royal Americans by the snake. Although the assignment of the 1763 date to the dial is not conclusive, the history of Fort Pitt, together with the design elements seen on the sundial and the location of its discovery, provides a plausible conclusion. A 5x3 meter analemmatic dial of natural limestone rocks with red flagstone and white limestone for month markers. Arabic hour numerals and month names are sandblasted into the stones. This dial was designed and built as an Eagle Scout project with an original request from the school science teacher, Mr. Rapatz. Roger Bailey of NASS provided technical guidance. An 87 x 37 inch vertical stained glass sundial in a second story window on the south wall of a tower at Richmond Hill, a historic monastery in Richmond. The glass area of the dial is frosted with hour lines and numerals read from the inside. Richmond Hill is open to the public Tuesday through Sunday; visitors are welcome to view the sundial, which is located in a tower accessible from the main lobby entrance. A phosphor bronze horizontal dial whose face is 17.7 inches across four rounded cruciform arms. Designed, made and presented by Tony Moss to commemorate the establishment of the first English settlement at Jamestown on May 14, 1607. The most striking feature is the inclusion of reproductions of the King James Great Seal of the English Virginia Company. The "navette" (little boat) shape of the seal is also reflected in a similar shape for the dial itself. These "English" features are balanced by an American input in the form of the "Celebrate Virginia" logo and that of the local Analemma Society that co-funded the pedestal along with Fairfax County Park Authority. A unique rounded-cruciform shape encompasses all the above elements together with the NASS logo and appropriate inscriptions. The dial is calibrated in 3-minute intervals and quarter hours. Square classical pedestal in reconstituted limestone made by Haddonstone UK. Pedestal is placed in a paved and railed area around the dial. A remarkable steel "safe" is provided to protect the dial and pedestal from theft or damage. A horizontal dial approximately 30 inches diameter reportedly cast from an old brass (bronze, likely) cannon and weighing 175 pounds. Dial was weathered and damaged by vandals but restored in 1970 using black light to reveal the original engraved markings, which were re-engraved. Access may require admission to arsenal. 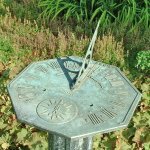 A 14.5 inch octagonal bronze horizontal dial on a cast iron pedestal. Dial was originally made for the present owner's great grandfather in the early 1900's. Face has Roman numerals with hour and half-hour markers. Compass rose cast in face aligns to magnetic north and stars of Big Dipper are shown. Dial was made originally for location near Northampton, Pennsylvania in early 1900's and is marked "41° LATITUDE." At present location, dial is tipped 1.2° for latitude correction. Two time arcs are shown on the dial face: "LONG DAY" arc extends from 5 AM to 7 PM; "SHORT DAY" arc extends from 7:30 AM to 4:30 PM. A 48 inch diameter bronze horizontal dial on a stone pedestal. Polar gnomon includes a scroll and stylized peacock. Dial furniture includes an hour glass and eagle wings. The perimeter around the dial is inscribed, "TIME LIKE LIFE CANNOT BE RECALLED." The dial sits atop a cylindrical mortared stone pedestal.